The Mobile unit has all aspects a typical salon would require such as: Multiple salon chair, sink, outlets for miscellaneous cosmetic appliances, mirrors as well as a bathroom. Furthermore there is also a TV and refrigerator for various refreshments clients might want. All of which create a real salon atmosphere. Salon Malina provides services all throughout Orange County thus creating a new innovative solution for conveniently salon visits. 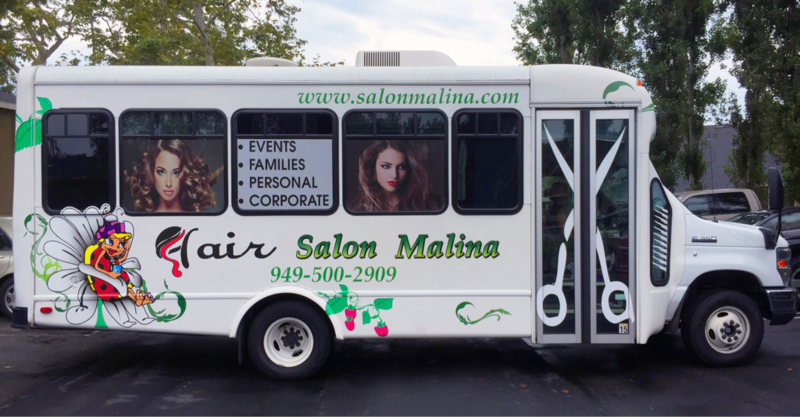 With a unique bus such as the Mobile unit 1, Salon Malina, we take the salon wherever the customer needs us to be, whether it is at work, or home, or even while on the playground with children; one can step into the mobile unit and receive a service like none other. The mobile unit is designed to fit all requirements, from baby haircuts to adult male or female, and everyone in between.